The fourth and final day in Las Vegas, and we made sure to end it right! The first thing we attempted to do was get tickets to see Michael Jackson’s, “ONE” Cirque Du Soleil. We asked around the day before and did some research, but apparently there are no discounts to be found. All the relatively affordable tickets weren’t available. Just in case we went over to the box office in Mandalay Bay to see if they had any. When we got there the line was long. After a decent amount of time waiting I found out the only tickets they had left where a little over $100 a ticket. The man in front of me was picking up the 29 tickets he ordered. I realized why there were no more cheap tickets left. We were slightly disappointed as we walked away. To add insult to injury, they were playing Michael Jackson music as we walked out of Mandalay Bay. We decided from there to head over to the Bellagio Buffet. The buffet wasn’t as big as the one we went to at the Rio, but the food was amazing! One of the most memorable things were the omelettes they make right in front of you. They also had some great dessert. I had to go back for seconds for the bread pudding and cheesecake. 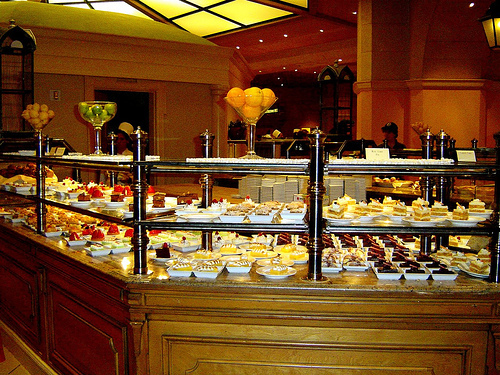 The Bellagio Buffet is certainly a must if you are in Vegas. After the amazing breakfast we had we took a walk around the Bellgaio Conservatory and Botanical Gardens. They change the look every so often. They had a snail and garden tools made of flowers. Simply gorgeous. They also had ponds with fish, and cameras in the water so you can view them swimming by. There are also a ton of birds flying inside of a big bird house. Leaving the Bellagio it was time to head to Fremont Street, which is Downtown Las Vegas were it all started. They have a lot of hotels that have been there forever, but many of them have been renovated and are really nice. Our reason for going down there was simple, we were going to zip-line. The zip-line is called SlotZilla. It cost $20. (They recently added a higher one where you can zip-line as if you’re flying like Superman.) It was my first time doing a zipline. The zip-line goes across The Fremont Street Experience. I was a little nervous, there is just concrete underneath and people below. The people who work there make you feel very comfortable and are reassuring. I had on flip-flops, and I had a bag. Those had to go in a bag that they attached to the back of me. They hook you up and warn you to keep your face away from the straps so as not to get hit in the face, especially when you get near the break towards the end. I was still a little nervous as I walked to the edge and leaned back into a sitting position. I have to say when you hit the end with the break, you hit hard. Others hit it before me so I was prepared. It was a lot of fun. I usually watch people do it, but it was a great experience. Once your done they show you pictures that they took of you. You can either get the first one for $20 and each additional for $5 or you can have them all emailed to you for $40. We decided to just email all of them for $40 because then you can just forward them. Once we had the pictures emailed, we walked around a bit. My friend wanted to get some souvenirs. So I suggested we go to the huge souvenir store on the north end of the strip near the Stratosphere called World’s Largest Gift Shop-Bonaza Gifts. That area of the strip is really trying to catch up to the other end. SLS Las Vegas opened a week after we left. Looks really nice from the outside. They are also getting ready to build some more hotels and casinos on that side. After shopping for souvenirs we headed back to the Luxor to go in the pool. There are four different pools in the area. Two of them you have to pay to be in the area. One has a ton of kids and the other has a bunch of people standing in there drinking with a few kids swimming around. I was disappointed that the pool only went to about 3 1/2 feet deep. The water was freezing so I didn’t stay in there long. Plus there were some cups floating in the water. We went back up to the room to relax and get ready for the evening. I found a deal on TravelZoo to get a limo ride, champagne, and a helicopter ride for $79. We got picked up by a limo around 7pm. There was a gentleman from France with his two little sons. They were very nice. We got to the helicopter spot pretty quickly. It took approximently 7 minutes. Such a short-lived limo ride. We went inside, signed in, and sat down. It was very nice and clean inside with comfortable seating. There were a lot of other people in there as well. They showed a safety video and then we waited a little while. They lined us up loaded us on a bus and took us out to the helicopters. They load the helicopters by weight, so I ended up in the front in the middle, which was cool because if you request to sit in the front it is $50 dollars on top of what you already paid. The helicopters can hold 8 people including the pilot. I put my headset on, but a lot of us couldn’t figure out how to use it. I am not sure if they were even working properly. I have never done a helicopter ride, but it was on my bucket list. It was a great experience. I only wish the pilot had come back down the strip with it being on our side of the helicopter. Everything was on the left side going up and coming back down. Weird, but that is what happened. It was fast too. We went up the strip, over to downtown, and back. The pilot was really nice and let everyone take pictures. The other folks and their helicopters started coming back as well. The bus started to take off and leave. They didn’t account for everyone, and we began running after it. When we finally got back to the building everyone found out there was no champagne because they didn’t get the order in, so we called boston executive limo service to come and pick us up and we then got back in the limo with the gentleman and his kids and were dropped back off at the Luxor. From there we went and got some food from the Rainforest Cafe at the MGM Grand. Since it was Friday night places began to get overly crowded. At this point I was beyond tired and wanted to just put my head down on the table. I ordered some food which was really good. Every 30 minutes they would have a thunderstorm and the animatronic animals would move. It was pretty cool. It was a great themed restaurant. Afterwards we walked around the Hershey Store and the strip. I also had to head back down to The Linq and grab some Ghriadelli. They had so many great things to choose from it was hard. I ended up with a mint chocolate chip sundae which wasn’t that big and cost about $10. We sat outside and watched a bunch of kids trying to breakdance on the stage as we eat our ice cream. The ice cream was really good, the chocolate was so rich that I ended up having to throw it away and then I got a stomach ache. Go figure. After getting back to the hotel I crashed. I wanted to go gamble a little since I had free play money on my Mlife card, but I was way too exhausted and fell asleep. It was such an amazing trip with a lot of new and great experiences. I loved every minute of it and can’t wait to get back to Las Vegas! Have you ever been to Las Vegas? Have you done any of the above activities? I haven’t been to the downtown area for a long time. I didn’t know they had a zip line. Your pretty adventurous with the zip line and helicopter ride. Thanks for sharing. Yea they have a zip line and added another above it. I was nervous, but I did it. It was a lot of fun. Went to Las Vegas 13 years ago, love it too, it was all so over the top! 🙂 And I remember those yummie buffets, sipping champagne for breakfast, … great memories! I hope you go back soon! It has changed a lot. The buffets are amazing, I love them! It’s been a long time for me as well but see a trip to Las Vegas sometime in the near future. It really is an over the top place and it’s good to see that hasn’t changed. I love Vegas, it is certainly over the top and they are constantly finding ways to do more. I love their buffet. That place is amazing.